If you have been paying attention to any sports broadcast since yesterday, the top story is Manti Te’o and his hoax of a girlfriend. The story was first broken by DeadSpin around 4:30 p.m. yesterday afternoon. If you have not yet made yourself aquainted with what their reporters found, I suggest you read it before going any further. Allow me to humor all of you. 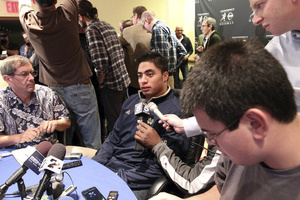 Let’s set a scene: Manti Te’o is in the locker room, young and impressionable. His teammates are jousting him about never seeing him with a girl around campus and such. One day, he can’t take the jokes so he blurts out, “I HAVE A GIRLFRIEND!” Everyone stops and stares. Up until this point no one has ever seen, let alone heard of, Manti Te’o with a girl. So, of course, the questions start. “Where is she from?” “Does she go to this school?” “What does she look like?” “Does she have a sister?” As the questions continue to hit Manti’s ears, he decides to run with this, even though he knows it isn’t true. This is the first time everyone left him alone about dating. As time goes on, he adds little things to the story like the fact that him and his beloved girlfriend only speak online as a part of a long distance relationship. That’ll explain why she never comes to any of the parties. Or telling everyone she was in a car crash around Spring Break because of course no one would believe that she couldn’t show up to hang out when everyone is OUT OF SCHOOL. And to add to everything, the doctors “find” that his girlfriend has leukemia because that gives you leeway if any other events come up that you can’t think of a plausible lie for. It kind of gives you leverage. The kicker comes when Manti’s grandmother actually passes away. Completely unexpected in the trail of lies. No one, and I mean no one, would believe that a woman that you love so dearly wouldn’t even show up for your grandmother’s funeral. So what do you do? Kill her off. Since the story broke, Notre Dame claims that they are completely behind Manti Te’o and explains how this young man is an exceptional person. Of course they did. Shockingly, Notre Dame didn’t break the story, someone else did. Highly ironic. Manti is young, duh. When you’re young, you never plan for a white lie to run out of control especially if that lie is to actually cover up the truth. After time progressed he had to keep going in the lie to the point that killing the girlfriend was the only way to get out of the situation. The school knew about what was going on prior to DeadSpin reporting it, so why, after the national championship, is all this stuff just pouring out. Could it be because it would make the runner up to the Heisman trophy look super bad and take away from the championship that they ended up losing anyway? The school was probably behind the fact that Te’o received so much publicity which has led to the explosion of the media. This story has been utterly exhausting, and I honestly wasn’t going to cover it because there are so many holes and misinformation that it gave me a headache. The only thing that makes sense is Manti Te’o was hiding something and to cover it up he told a lie so big that it will probably screw up his chances in the NFL. I mean, really dude, he either has a major secret or is really really stupid to be a part of something like this whether he knew or not..